At the western end of the city centre lies the Palacio Real, and the Cathedral La Almudena. The palace is located at the spot where the city was founded in the 10th century. After the old alcazar burned down on Christmas eve 1734, construction on the new palace began in 1738 and was completed in 1755. Since 1931 the palace is only used for official ceremonies. The royal family lives are the much smaller Palacio de Zarzuela in El Pardo, just north of Madrid. To the west of the palace is the English garden, called the Campo de Moro, while of the northside lie the Jardines de Sabatini. On the southside of the palace lies the newest part of the palace that was added in the 19th century, and surrounds the Plaza de Armas from three sides, on the other side of the Plaza de Armas lies the Cathedral La Almudena. On the eastside of the palace lies the Plaza de Oriente and behind that the Opera and the city center. The Royal Palace is opened for visitors between 9:00am and 6:00pm, in winter (October until March from 9:30am until 5:00pm). On Sundays and Holidays, the building is opened between 9:00am and 3:00pm (in winter from 9:00am until 2:00pm). Normal visits to the palace cost €8, if you want to join a guided tour it will cost you €10. It is also possible to include the Picture Gallary into this guided tour, which will cost €1 more. The nearest stop is the metrostation of Opera. 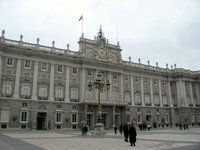 After leaving the station walk beyond the Opera building, and across the Plaza de Oriente you will see the Palacio Real. This is version 5. Last edited at 15:02 on Dec 3, 10 by Utrecht. 2 articles link to this page.